The problem that I’m going to describe below does stray away from Thorn and into another manufacturers back yard to some extent so I completely understand if the topic is moderated off the Thorn forum. 1. Sell the recumbent as is and buy a Raven frame, share wheels (well back wheel anyway) with our Raven Twin tandem. I know the external shifter box isn’t compatible with the Raven but I can either use cable ties to route the shifter cables to the down tube or I could orientate the EX box so that the cable entry points upwards and use the existing fittings on the top tube. Just as Thorn did on the early Rohloff off-roaders. 2. Sell the recumbent as a frame/seat only and use its Rohloff and dyno wheels on the Surly Disc Trucker. Why not use the wheels on a Thorn I hear you say? They are disc only rims. Yes they could be rebuilt but the main point was to get a good tourer for the minimum expenditure. Though the Surly would need to use a Rohloff tensioner (which I already have on the recumbent) I had resolved to buy the Surly. I thoroughly believe the Raven to be the better frame and know SJS to be an absolute pleasure to deal with the Disc Trucker seemed to be the best route to getting my hands on a Rohloff tourer. Resolved that was until I realised just today that the wheels on the recumbent have 18.5mm rims. Fine for the 1.6 Supreme’s I use on the bent but I want the new bike to shod with 50mm tyres. Sheldon’s tyre compatibility chart would suggest 40mm is the max for these rims. As an experiment I have just fitted a 50mm Dureme on 2 different rims, one 21mm the other 18.5. On the wider rim the Dureme measures 48.6mm, on the narrower rim 47.8mm. • Stay on course with the Surly and don’t worry about rim/tyre compatibility. Doesn’t really seem like a good idea. • Stay with the Surly and use different tyres, 1.75 Pasela’s for example. One reason for moving off the recumbent was have more off road ability so do I really want restricted tyre width. • Keep the Dyno hub and Rohloff but have new rims fitted. This would allow me to either stay disc or go rim and buy the raven. 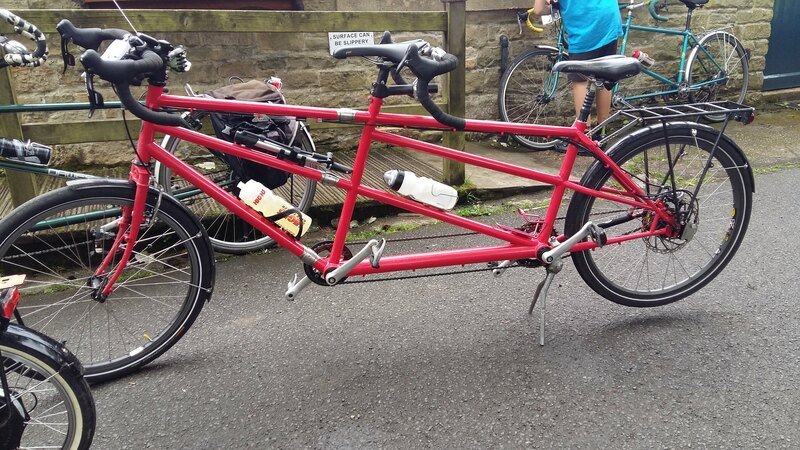 • Sell the recumbent whole and buy a raven to share wheels with the Tandem. The big plus for this is that don’t need to spend any money, in fact I’ll likely end up with cash left over after selling the recumbent. I am going to simply say one thing. Please don't buy a Surly! Why? Because they have no style. A cyclist must have style. All the best with your dilemma. I understand your dilemma of choices and can sympathize with the challenges. • Swapping wheels is a great way to get what amounts to two bikes for minimal cost, but...if you do it very often, it quickly gets old. I have found even small impediments that require time and fussing can derail me from taking a given bike in my stable for a ride...even swapping things like pumps, bottles, and underseat toolbags. I've now equipped each bike so it is complete to itself and...just get on and go. Over the course of time, convenience tipped the scales for me and I splashed out for the things that would make riding more convenient. • Fitting new, wider rim brake compatible rims to your present hubs would result in the most versatile wheelset: 1) They could be better matched to your intended tire width, 2) Could be used with disc or rim brakes and so are not so bike-specific (as you have noted). This appears the next most thrifty option after swapping wheels between bikes. • Ask yourself how much/important/frequently you'll go off-road. If enough to warrant fitting wide tires all the time, then this will help tip the scales. While tire and rim width compatibility are important to maintaining tire profile and good handling while minimizing risk of rim failure (splitting), pressure is a key component in the mix. One implied takeaway is one can likely get away with running wide tires on narrow rims if the pressure is low (i.e. big knobby fat MTB tires on narrow rims, as has been done for years). Offroad use seems to be more forgiving of larger tire/rim mismatches due to the lower pressures involved and the road interface (i.e. dirt instead of paving...and generally lower speeds). Assuming you had adequate clearance on any of the bikes under consideration, it might be possible to keep the same wheelset and simply fit wider tires run at lower pressures on those occasions when the dirt calls. In my case, the existing wheelset (19mm between bead hooks) was ideal for the 26 x 1.6in tires I have been running, but for reasons of comfort and versatility (and greater use on poor surfaces), I want to fit 2.0 tires. The deciding factor on rim width in my case is weight: This is a tandem that will carry two people and a touring load, so tire pressure will need to be habitually near the upper end of the allowable scale when the bike is toured. Unladen, I have found no problems with the mismatched rims/tires at lower pressures, but add loaded panniers, a rack-top load, the trailer and water that allows for extended touring for two and I feel I'm really pushing the limits compared to running a similarly narrow rim (Andra 30 with 19mm between bead hooks) and 2.0 Duremes on my Nomad. Even with an expeditionary load, the gross weight of the Nomad falls short of the tandem (no second person or trailer). Like you, I fitted my 2.0 Duremes to two rims of the same widths as you did and duplicated your numbers for inflated tire width. I don't think the difference of 0.8mm will have any significant effect on handling. I'm considering an Andra 40 with 25mm internal width vs the Andra 30's 19mm, a 6mm difference which the research indicates will only be "better" at maintining an ideal tire profile and section width. I've had no adverse handling issues with the 2.0 Duremes on the Nomad's Andra 30s, so the issue I'm still looking to resolve on the tandem is mostly related to avoiding rim splits at higher pressures. If I were in your position, I'd Keep the Dyno hub and Rohloff but have new rims fitted as the best balance between cost, versatility and convenience. This would put your frame options down to cost and preference. One of the advantages of the Thorn rohloff bikes is that they are designed from the rohloff up. That is all the attachments and braze-ons are just right for the rohloff hub. I'd be reluctant to go down a route where I needed a chain tensioner, I'm sure they would work fine but I can't help believe it is a compromise rather than an EBB. You don't really say what you want the bike for -if it is load carrying and reliability over all terrain then the Thorn raven will do that as well as anything on the planet. If you want to go beyond the middle of nowhere then the nomad is an option. The raven is good value and will retain its value if your use changes. Geocycle; - The bike will be my all purpose everything bike. I still have my Thorn Audax Classic and it will be the go-to bike for short fast rides, credit card tours and of course Audax events (though life seems to have gotten in the way of those lately). The new bike will be my everything else bike; loaded tours, utility cycling & shopping, short rides were the terrain doesn't suit the Audax, Family rides when not using the tandem and anything else. The thorn is a much better Rohloff bike, the eccentric BB and dropouts see to that. While the Surly with a tensioner doesn't look as good and certainly is the worse engineering solution it has worked just fine on my recumbent for the last 5 years. To me though the main weight in favor of Thorn over Surly are the forks. Thorn do the best forks IMO. I even have a Raven Tour fork (factory second for £30 from SJS ) on my 20 year old Trek MTB that currently serves as my utility bike. Interesting observations on rim/tyre combinations and you know I think your quite right about not getting too hung up over having the perfect match. Indeed since making my original post I've realised that the Andra 30 on the front of our Thorn tandem is a 19mm rim and has been running 50mm Dureme's for the last 3 years with no issues. Perhaps I've spent the last few hours pointlessly worrying. My tandem has its rohloff in a Mavic EX721 ceramic heavy duty rim and a SON28 in an Andra 30 up front. I also have a non-dyno front wheel in a Mavic EX721. The Rohloff from the recumbent could be built into a light wight rim like the Ryde Grizzly giving me the ultimate versatility. Day rides and such and the new Raven would run the light weight wheel, loaded touring,- simply borrow the tandem's rear wheel. And its all made much easier by the new splined rohloff sprockets. That sounds like a good combination. My raven sport tour is my everyday commuting and loaded touring bike. I have recently started using a derailleur audax bike which adds to the enjoyment of day rides. Very happy at the moment! The Rohloff from the recumbent could be built into a light wight rim like the Ryde Grizzly giving me the ultimate versatility. Day rides and such and the new Raven would run the light weight wheel, loaded touring,- simply borrow the tandem's rear wheel. And its all made much easier by the new splined rohloff sprockets. Combined with your older Audax, this sounds like a really good overall solution to me, Joe. I share your thoughts, I have found that a 57mm wide tire on an Andra 30 rim can't be run very well at lower pressures. My notes say that rim is 19mm. But, a tire that is 50mm wide might work well enough for you to use the existing rims. You already know what tires you want to use. Buy a set of tires and try them on the existing rims to see how they work. If then you find you really want different rims, go that route. But if you find that the existing rims are good enough, you saved some money and downtime. We all form our opinions on our experiences, I suspect my experiences differ from Dans because I wanted to run lower tire pressure on the wide tire on rough gravel road for better traction on uphills. I found that sometimes on a steep hill I would break traction (spin out) and come to a rapid halt at higher pressures. But I expect that at lower pressures, the tire would be less likely to break traction on a bad road. Every time I lost traction, I had to push the bike up the hill because I could not start out on a heavily loaded bike on a steep uphill. At low pressure with that narrow of a rim on that wide of a tire the bike felt too wobbly, it felt like it would wallow around. The road conditions I am specifically thinking of are like those shown in the photo. But my next tour on that bike I plan to use 50mm wide tires, I have found those tires to work well enough with that rim width that I am not concerned. Ideally the rim would be a bit wider, but I think it will do well enough. Interestingly the Mavic EX721 rims that came on my secondhand Raven Twin are a couple of hundred grams lighter than the Andra 30. With that in mind I might put the these wheels on the new bike and re-build the recumbent's Rohloff with an Andra 30 for the tandem. I think I'm settled on a Raven now, it will cost more than a Surly frame but if necessary there are other ways I can balance the books: SKS guards rather than the Gilles Berthoud's that I was planning for, using the Brooks B17 currently on my old Trek MTB rather than that nice new Cambium I been lusting after, and using the wired Dureme's I have in the loft rather than the folding Dureme's I was going to buy. I'll take another week to refine the idea before pressing the button on a purchase, the rim problem was easy, red or black? Now there's the real conundrum. ...red or black? Now there's the real conundrum. Indeed! Both are ideal. I'd only suggest that if the bike is subject to rough handling (i.e. off-road and transported as baggage), it is easier to make invisible touch-ups to the black. However, red is likely faster! I was torn between the matte black and Tonka yellow for my Nomad and finally went with black due to the intended use and because it is more stealthy and less noticeable when parked or wild camping. I have not regretted it, but always admire the brighter colors as well. For this reason I will be respraying another of my bikes neon pink with electric blue trim. You might like this then Dan. Check out the rather fancy Rohloff shifters too. Actually, now that I look at that photo again I see that it has the same rim on the rear as my tandem. Perhaps they were the Thorn standard at one time. You don't necessarily need a chain tensioner, even on the Surly you are considering. I have been running a Rohloff on my Thorn Sherpa without a chain tensioner for about six years. You just have to choose your chainring/sprocket combination carefully, a 'magic gear' calculator is useful here. You have to change to a new chain more often (about the same frequency as you would on a derailleur system) but thats no big deal.